California Gov. Gavin Newsom said Thursday that Pacific Gas & Electric Corp. plans to remake its board of directors with hedge fund financiers and people who have little experience in utility operations and safety, and he urged the utility’s leader to change course. But the company has not announced its slate of candidates for the new board. 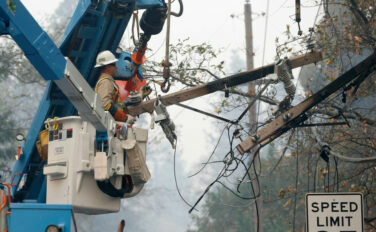 Newsom’s office was briefed by PG&E executives on their proposed slate in recent days, spokesman Nathan Click said. The governor’s office is not releasing the names either. A spokeswoman for the utility did not directly address who the utility is planning to name for the board or when it will make an announcement. Lynsey Paulo said the utility understands “the serious concerns expressed by the governor” and his urgency. “We recognize the importance of adding perspectives to the Board that will bring about the right changes in safety, as well as help address the serious operational and financial challenges the business faces now and in the future,” she said in an emailed statement. “PG&E needs a board with proven experience in safety, claims resolution, utility operations, finance and turnarounds, and California business and public policy,” the shareholder group said in an emailed statement. The Utility Reform Network, a consumer advocacy group, praised Newsom’s public comments. “It was a very good thing for the governor to serve notice that replacing the board with the same kind of Wall Street interests that have put profits in front of safety for so many years is not going to solve the problem,” executive director Mark Toney said.